Designing your vMotion networking – Choose link aggregation over Multi-NIC vMotion? The “Designing your vMotion network” series have lead me to have some interesting conversations. A recurring question is why not use Link Aggregation technologies such as Etherchannel to increase bandwidth for vMotion operations. 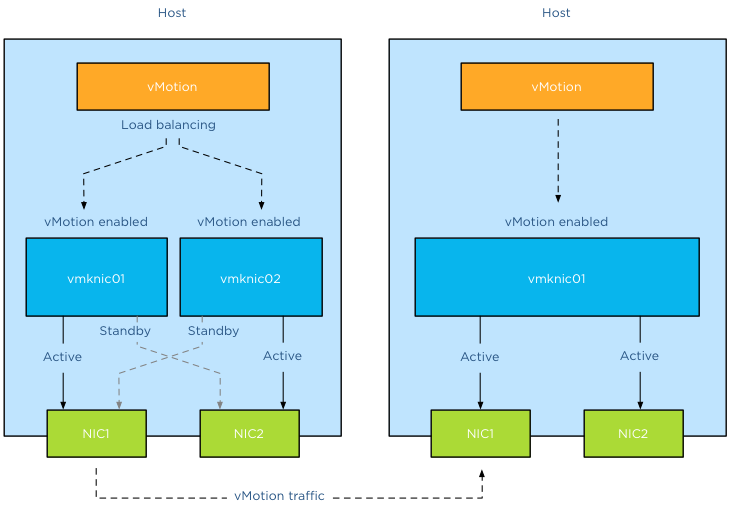 When zooming into vMotion load balancing operations and how the vNetwork load balancing operations work, it becomes clear that Multi-NIC vMotion network will provide a better performance that an aggregated link configuration. In order to use vMotion a VMkernel network adapter needs to be configured. This network adapter needs to be enabled for vMotion and the appropriate load balancing policy and network adaptor failover mode needs to be selected. 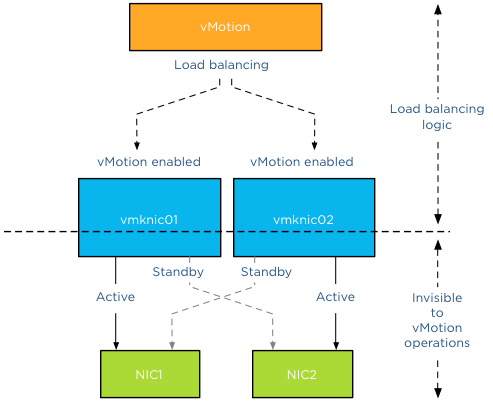 The vMotion load-balancing algorithm distribute vMotion traffic between the available VMkernel NICs, it does not consider the network configuration backing the VMkernel NIC (vmknic). vMotion expects that a vmknic is backed by a single active physical NIC, therefore when sending data to the vmknic the traffic will traverse a dedicated physical NIC. It’s important to understand that vMotion traffic flows between distinct vmknics! Migrating a virtual machine from a source host configured with Multi-NIC vMotion to a destination host with a single vmknic vMotion configuration result in the utilization of a single vmknic on the source host. Even though the single NIC vMotion is configured with two active uplinks, the source vMotion operation just selects one vmknic to transmit its data. Link aggregation allows you to combine two or more physical NICs together and provide higher bandwidth and redundancy between a host and a switch or between two switches. Whenever you want to create a bigger pipe to carry any traffic or you want to provide higher reliability you can make use of this feature. However, it is important to note that the increase in bandwidth by clubbing the physical NICs depends on type of workloads you are running and type of hashing algorithm used to distribute the traffic across the aggregated NICs. And the last part is the key, when you aggregate links into a single logical link, it depends on the load balancing / hashing algorithm how the traffic is distributed across the aggregated links. When using an aggregated link configuration, it’s required to select the IP-HASH load balancing operation on the portgroup. I’ve published an article in 2011 called “IP-hash versus LBT” explaining how the hashing and distribution of traffic across a link aggregation group works. Let’s assume you have Etherchannels in your environment and want to use it for your vMotion network. 2 x 1GB aggregated in one pipe, should beat 2 x 1GB right? As we learned vMotion deals only with vmknics and as vMotion detects a single vmknic it will send all the traffic to that vmknic. 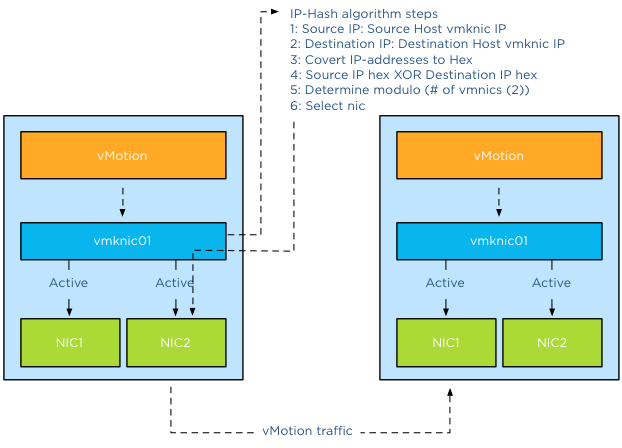 The vMotion traffic hits the load-balancing policy configured on the portgroup and the IP-Hash algorithm will select a vmnic to transmit the traffic to the destination host. Yes you read it correct, although the two links are aggregated the IP-Hash load balancing policy will always select a single NIC to send traffic. Therefor vMotion will use a single uplink (1GB in this example) to transfer vMotion traffic. With IP-hash a vMotion operation utilizes a single link, leaving the other NIC idle. Would you have used Multi-NIC vMotion, vMotion would have balanced the traffic across the multiple vmknics even for a single vMotion operation. Using the same scenario, vMotion determines that this host is allowed to have 4 concurrent vMotion operations. Unfortunately IP-Hash does not take utilization into account when selecting the NIC. The selection is done on a source-destination IP hash, decreasing the probability of load balancing across multiple NICs when using a small number of IP-addresses. This situation is often applicable to the vMotion subnet; this subnet contains a small number of IP-addresses used by the vMotion vmknics. Possibly resulting IP-HASH selecting the same NIC for the same concurrent vMotion operations. This in turn may lead to oversaturating a single uplink while leaving the other uplink idling. Would you have used Multi-NIC vMotion, vMotion would have balanced the traffic across the multiple vmknics, providing an overall utilization of both NICs. Link aggregation does not provide a big fat pipe to vMotion, due to the IP-Hash load balancing policy, a single nic will be used for a vMotion operation. IP-Hash is not utilization aware, possibly distributing traffic unevenly due to small number of source and destination IP-addresses. Multi-NIC vMotion distributes vMotion traffic across all available vmknics, for both single vMotion operations and multiple concurrent vMotion operations. Multi-NIC vMotion provides a better overall utilization of NICs allocated for the vMotion processes. Does a vDS with LACP change these results? While I haven’t tried with VMWare, LACP since the routing policy isn’t decided by a static IP Hash, but by a algorithm based on theNIC / switch utilization. can you please share your experience and benefits/drawback of enabling jumbo frames for VLANs used for vMotion. The biggest benefits of Jumbo frames is lower CPU utilisation when transmitting vMotion traffic. The funny thing is, while monitoring vMotion, its the receiving host that is getting hit harder on CPU utilisation than the transmitting host. The drawback is that the entire infrastructure needs to be configured for Jumbo frames. All the virtual and physical switch elements. This effort involved usually outweighs the benefit. Having an incorrect configuration can do more harm than a properly configured environment can benefit from Jumbo frames. what about vMotion speed, in addition to CPU load would it be more efficient and faster to move VMs between cluster nodes when Jumbo frames are enabled ? A question relating to Lee’s post. Is there any sense to you to use two uplinks bundled in an aggregate (LAG) with Multi-NIC vMotion to give on one hand more throughput to vMotion traffic and on the other hand dynamic protocol-driven mechanisms (either forced or LACP with stuff like Nexus1Kv or DVS 5.1)? Most of the time, when I’m working on VMware environment, there is an EtherChannel (when vSphere < v5.1) with access datacenter switches that dynamically load balance traffic based on IP Hash. If i'm using LAG, the main point to me is that load balancing is done independently from the embedded mechanism of VMware (Active/Standby for instance). Do you think that there is any issue on using LAG instead of using Active/Standby design with Multi-NIC vMotion? Do you feel that there is no interest on using LAG over Active/Standby (from VMware point of view and for hardware network point of view)? Thanks for your comment. I received multiple emails with similar questions. After completing my reply I realised that its the length of a blog post. Therefor I will answer your question tomorrow with a blog article. If you have 4 uplinks on the VDS how would you do the active stand by setup? Would it be 2 active 2 stand by on each vmotion port group?